MDA compiled Kessel's statements, as well as over 6,000 pages of evidence from a whistleblower they had been working with separately, and which they filed secretly over a year ago with the FBI and IRS. MDA has alleged that the Clinton Foundation engaged in illegal activities, and may owe millions in unpaid taxes and penalties. Of course, to hear the news of the imminent prosecution of the Clinton regime will be surprising to some readers. In fact, many truth-seekers may not have expected to see such legal action take place for a very long while (if ever). Yet here we see these actions and indictments being openly discussed—not so much by the corporate media in any significant way, but in a way that is highly visible and notable nonetheless. 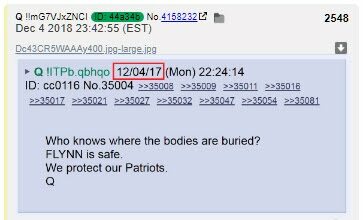 Those who are not so surprised may have caught onto the notion that the above report was actually predicted rather cryptically by a familiar source. The 8Chan source, Q Anon, actually made a very specific comment regarding this supposedly figurative topic of buried bodies. The phrasing of this quote was nearly identical to that of the above article, yet the statement from Q was made two days prior to the actual news story. What are the chances that the source behind Q Anon knew that these issues surrounding the Clinton Foundation were about to break in news reports? At first glance, these statements from Q may appear to be talking about Michael Flynn. 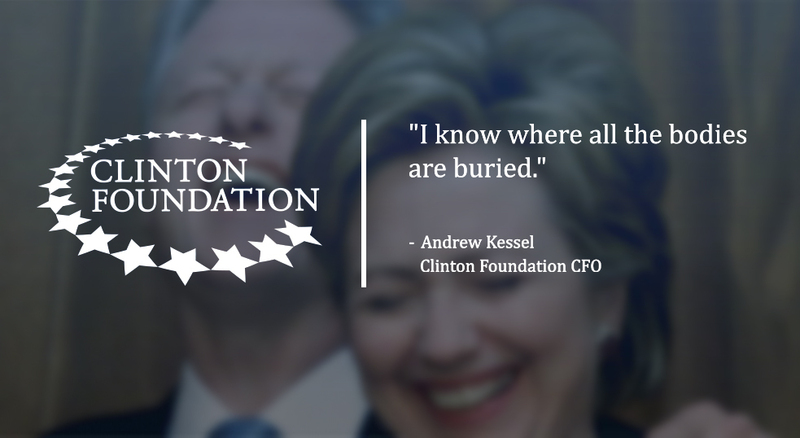 However, according to what we see now from the fairly identical statements of Q and former Clinton Foundation CFO, Andrew Kessel, it seems more likely that Q was referring to Kessel instead. Along with these observations, there also appear to be several subtle and yet extremely weighty suggestions hidden within these statements from Q. It seems very likely that there is some significant connection between the Q group and Andrew Kessel's testimony. After all, there does not appear to be any explanation more probable than such a connection. It is as though the same interests that are protecting Kessel are either in contact with the Q group, or these protectors are working directly with the Q group. This further suggests that who or whatever Q Anon is, they seem to be in close contact with those who have military-level capability for witness protection. Hence the statement about the ability to protect patriots. By all appearances, there now exists a significant amount of Alliance opposition to the infamous Cabal violence that appears to follow (and assist) the Clintons wherever they go. If this protection does exist, we may expect to see even further and more substantial revelations from former Clinton collaborators who turn whistleblower. Whether these individuals feel they have an ethical obligation or they wish to avoid prison themselves, it now appears that at least some level of protection is now in place for such whistleblowers to come forward. The testimony of former Cabal members is vital not only in prosecuting high criminals but in educating the general public so that past atrocities committed by these elitist criminals never happen again. As these testimonies progress, we may be in store for far more shocks and surprises than we have received thus far. It may even be that at some point, the suggestions of murder charges won't be so figurative. WATERGATE WAS PEDOGATE - Has this Massive Scandal from the Past Come Full Circle?